NAIROBI, Mar 2 2012 (IPS) - At Gakoromone Market in Meru, in Kenya’s Eastern Province, Ruth Muriuki arrives in a pickup full of tomatoes and cabbages despite the scarcity of rainfall in the area, thanks to the greenhouse technology she uses on her farm – and microcredit. “A bundle of ten tomatoes which would cost Sh40 (50 cents of a dollar) three months ago is now going for double the price. But we have no choice,” said David Njogu, a vegetable dealer at the open-air market. Muriuki is selling a big sugarloaf cabbage, which would have cost 50 cents three months ago, at 1.50 dollars. A spot check in the country shows that prices of horticultural produce have shot up in the past three months following the failure of short rains, which were expected to come between October and December last year. However, farmers who use the greenhouse technology do not need rainfall for their crops to grow. In the greenhouses, generally made of glass or transparent plastic roof and walls, temperature and humidity can be controlled, making it possible for farmers to grow crops year-round. 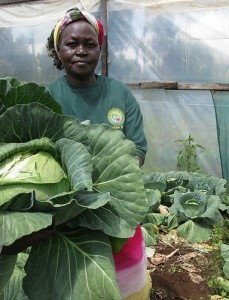 “I bought my greenhouse through credit offered by a local microfinance institution. Through the project within the past two years, I have been able to buy a maize milling machine, I have put up a retail shop, I have bought two dairy cows, and I have bought a stock of 400 kilograms of maize, which I intend to sell once the prices shoot up,” said the 28-year-old mother of one. From a single greenhouse, she picks an average of four crates of tomatoes per weekly harvest, which fetches her about 100 dollars per week. Nandi hills is one of the dry regions in the country, where rainfall is not guaranteed throughout the year. “Our boy is still young, that is why we are investing in businesses, so that I can stabilise my level of income ahead of him joining school,” said Chebet. Her husband is in charge of other farm projects on their five-acre piece of land. Amiran, one of the biggest horticultural companies in Kenya, specialises in construction of greenhouses as part of its business. However, other farmers depend on individual builders who know how to make greenhouses. “In order to reach out to as many farmers as possible, we have signed an agreement with three finance institutions: the Kenya Women Finance Trust, Equity Bank, and the Co-operative Bank of Kenya,” said Tuwei. At the same time, the CIC Insurance Company now has a policy to cover the hardware component of professionally constructed greenhouses in Kenya, in case they catch fire, are blown down by heavy winds, or are destroyed by any other natural calamity. “I have discovered that greenhouse farming and general farming through irrigation is the way to go because rain-fed agriculture has failed me many times, especially in the recent past. The rains are no- longer reliable,” said Muriuki, a 64-year-old mother of seven. But on barely one acre of land in Karimagachiije village, 15 kilometres outside of Meru town, Muriuki is able to produce at least a ton of vegetables every week through greenhouse farming. She sells the produce to different markets in Eastern and Central Kenya, earning enough to pay college fees for her two youngest daughters in different universities in the country. “This was my first opportunity to pay school fees. Before I started this project, it was solely my husband’s responsibility,” she said. However, like Chebet, she was not in a position to raise the required amount of money to set up the horticultural project. “Three years ago, I approached the Kenya Women Finance Trust, where I borrowed Sh300000 (3,750 dollars) as the capital for my farming project,” said Muriuki. The Trust is dedicated specifically to empowering Kenyan girls and women through lending facilities. The loans are mostly given through self-help groups, where shares of the group members are used as security for loans borrowed by any of the members, because many poor women do not own property that they can use as collateral. So far, the microfinance institution is financing close to 500,000 low-income Kenyan women to run different small-scale entrepreneurships not limited to agribusiness. “In my greenhouse, I use a drip irrigation system, where water is released through pipes strategically buried in the soil with an opening at the foot of every plant. This maximises the use of the little available water, because the drip system does not allow runoff or deep percolation,” she explained. In Kenya, the average cost of building a greenhouse ranges between 1,250 dollars and 3,125 dollars, depending on where one is buying the materials, the quality of the materials and the size of the structure. We have microfinance in the USA. ACCION, Opportunity Fund, WISE, Business Center for New Americans, etc.